No doubt many of you can’t wait to get out into those crisp winter days, with the countryside bedecked in a white mantle of snow and the iced-up pools and puddles glistening in the pale winter sunlight. Alas, here in wind-swept Mid-Wales there is no snow, no ice and little sign of the sun at the moment. 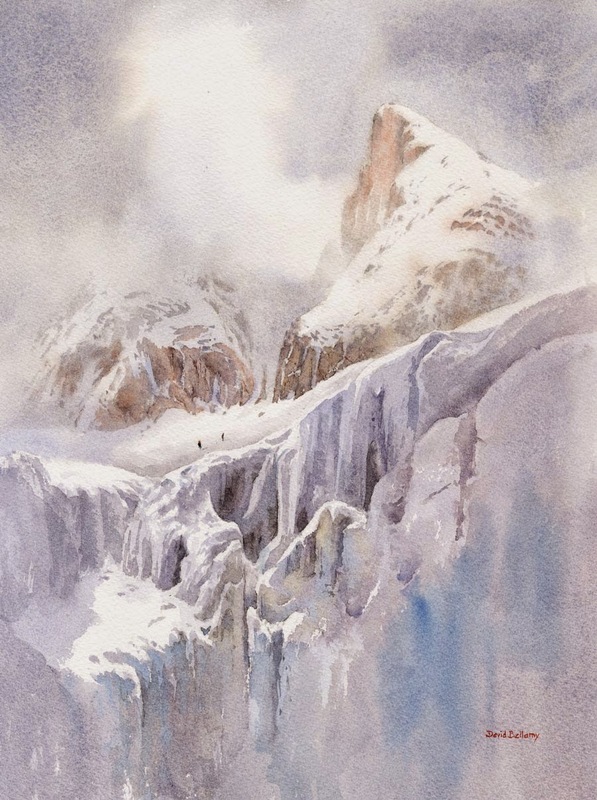 Still, in anticipation of an icy bonanza in the not-too-distant future lets have a look at capturing ice in watercolour. This is a small part of a watercolour painting of Ffynnon Lloer, The Well of the Moon, a beautiful tarn high up in Snowdonia. It was completely covered in ice when I last visited it. To achieve an ‘icy’ effect rather than a watery one you need to keep the surface of the water absolutely smooth – no ripples, unless you want to apply some to an area of open water. This latter method can help to show the contrast between the ice and water. 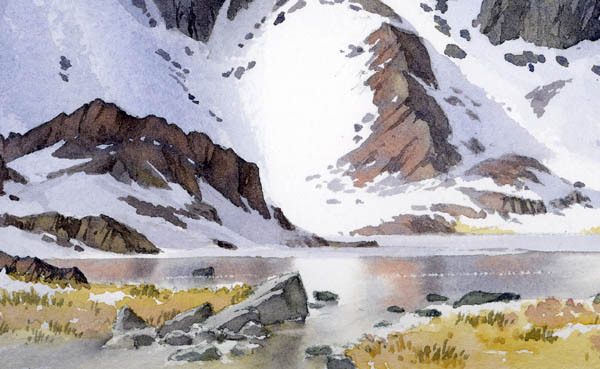 Any reflected features, such as the rocks in the above painting, should be kept simple, lacking in strong detail, and use vertical strokes of the brush when applying these reflections. I always find it works best if I use the wet-into-wet method as in this picture. If you bear in mind those few principles when you tackle ice it will hold you in good stead. Ice is one of my favourite subjects, whether in glaciers, ice-caps or just general winter scenes. Enjoy your painting in 2012 and may it be your best artistic year ever.